The basic modern approach to boundary-value problems in differential equations of the type (0.1)-(0.2) is the so-called energy-method technique which took the name after a-priori estimates having sometimes physical analogies as bounds of an energy. 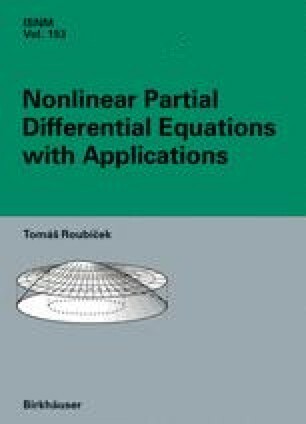 This technique originated from modern theory of linear partial differential equations where, however, other approaches are efficient, too. On the abstract level, this method relies on relative weak compactness of bounded sets in reflexive Banach spaces, and either pseudomonotonicity or weak continuity of differential operators which are understood as bounded from one Banach space to another (necessarily different) Banach space. On the concrete-problem level, the main tool is a weak formulation of boundary-value problems in question, Poincaré and Hölder inequalities, and fine issues from the theory of Sobolev spaces.